We've got an incredible lineup of classes for our Fall 2018 Semester! We also offer special one-day workshops with industry professionals - any active workshops will be listed below! All classes will begin the week of September 16th - see the class description and sections below for specific end dates, tuition costs and other details. 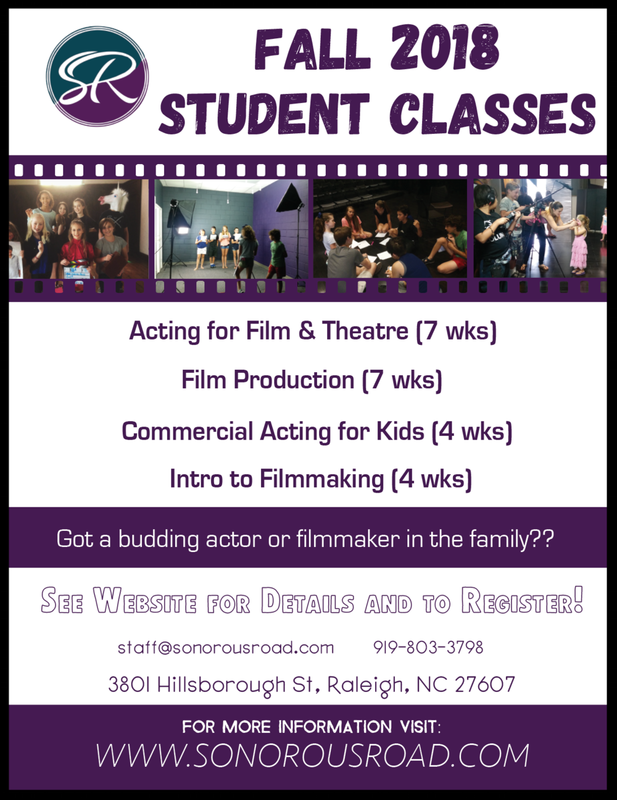 If you have any questions on any of the classes please don't hesitate to reach out to us at staff@sonorousroad.com. Enjoyed one of our acting camps in the past? Then this is the right class for you! Continue your eduction of on camera techniques and improve your skills for auditioning for film and TV. This class is perfect for students looking for an introduction to acting or experienced actors who want to challenge themselves with new scene work and monologues. No experience is necessary but we do expect all of our students to come serious about working and learning - while we also have a lot of fun! Do you love being behind the lens? Using a hands on approach, students will learn about making films from start to finish. Following our summer camp approach - class begins with screenwriting and preproduction planning while students develop a story and learn what it takes to move their story into production. Students will discuss professional production techniques such as professional lighting, sound, and cinematography. Over the course of the 7-week session the students will write, film, edit, and produce a short film that and students will receive a digital copy of the completed film after the session ends. Interested in learning about acting in commercials? This is a great session to dive right in, learn the business, and get some practical training in the field of commercial acting. Topics covered will include breaking down commercial copy, on-camera technique, cold reading & improv, and more! Students will receive a copy of their final mock audition after the class is completed. Are you curious what it takes to make a film? This special 4-week session is a condensed version of our full 8-week Filmmaking class. Students will learn about the process of making a film from start to finish and get exposure to screenwriting, preproduction, and the filmmaking process itself. This class is perfect for students of any background who want exposure to filmmaking or to refine their existing skills in a short, 4-week session.